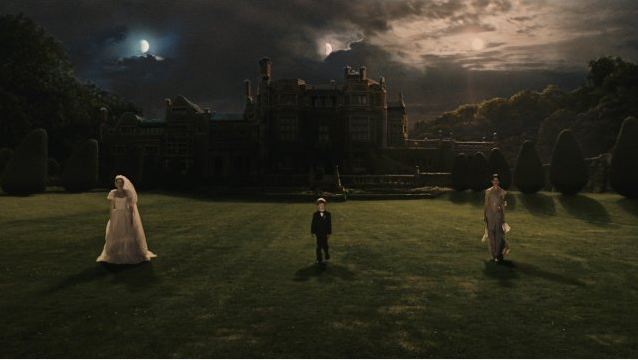 Melancholia (dir. Lars von Trier): ***. What was Lars von Trier thinking? Well in the first half of the film, it seems clear enough, actually. Everything is there: the background of doom, the human events, the unfolding realisation that all the female characters are mad… The images are often beautiful, save one great yawning missed opportunity: if a giant planet is THIS CLOSE to earth (any planet sufficiently close is giant), wouldn’t it be beautiful, by its alien nature, its colours, the sheer fact of a sister planet being RIGHT THERE? But Lars gave us some cheap video effect instead. What was he thinking? The second half tottered on, the feeling of doom well exhausted by the 2/3 point. I think Kifer Sutherland may have had this on his mind when he offed himself. Don’t get me wrong, I am in the club of 28 people worldwide who sort of love LvT, even though all his films are a bit sick. He could have done better though, even on his own terms. We need to talk about Kevin (dir. Lynne Ramsay) *****. This is one of those rare masterpieces of disturbing psychology that makes you start looking differently at ordinary people on the street. Tilda Swinton really produces a perfect performance: a mother who tries to love her child while hating him for hating her, for being so damned incomprensible, while loving him in those few moments when she seems to be able to imagine the chaos and fear that must be his internal world. By a stroke of luck I saw this film without knowing the story so had the pleasure (if you can call it that) of being blown away in the same way as the rest of Kevin’s family in the film by the horror of his actions. The genius of the film is that you get to the final act (possibly with nothing left of your fingernails), and to realise that everything you have seen up until then is completely seamless with the denouement. It has probably written a new chapter on how to deliver all the information in a completely natural way, at the right time and the right place, without the viewer realising anything, and then at the end you think: oh god, of course, all the signs were there. The battle of Warsaw: 1920 (dir. Jerzy Hoffman) *** This epic Polish film is disorganised and over-ambitious, but riveting viewing – entertaining, educational and not without charm. My IMDB review. Tinker, Tailor, Soldier, Spy **** (dir. Tomas Alfredson). I’m not into spy novels as such, but enjoyed this film no less for it. It really feels like a le Carre novel – in this spy world, heated arguments in MI5 rooms and rented apartments full of dusty files are the foreground to the main game, the nasty and brutal events taking place out in the real world. Wonderful performance by Gary Oldman, also Colin Firth, and a rakish Tom Hardy. First rate. This entry was posted in Culture, Film and tagged Film, film review by wolandscat. Bookmark the permalink. Hadn’t heard about WNTTAK, but it sounds good. And I’m glad to hear that the new TTSS lives up to my hopes. I do like Gary Oldman, when he’s on target.